February 2014 - Touch Display Research, Inc.
I’m traveling in the beautiful Nuremburg, Germany for electronic Display Conference (eDC) 2014. Even though it’s raining today, the conference still had over 260 attendees. In the touch session in the morning, Dr. Roland Aubauer from Microchip Technology discussed 3D gesture touch controller they developed. Mr. Bob Raikes, from Meko (also my industry friend) gave a presentation titled “Just because touch works on a phone, it’s not always the answer”. He jokingly suggested the PC should add a foot pedal, so like driving a car, we can use our foot to do left click or right click. Even that is a joke, but he does have a good point: besides finger touch, there are many other methods to do machine-human user interface. At the keynote session, Dr. Jyrki Kimmel from Nokia could not come in person, so he gave the keynote about displays in the mobile ecosystem on the telephone, while the conference chairman Professor Doctor Blankenbach helped to click through the slides. It went well. 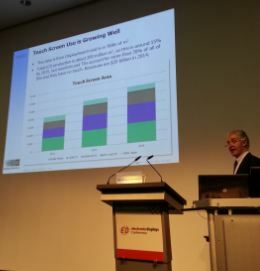 Then on behalf of Touch Display Research, I gave a keynote on the touch screen and emerging display market. I first thanked the conference organizer and our sponsor company Data Modul. I then discussed 7 new opportunities in the touch and display market: phablet, NB and AIO PC with touch, ITO-replacement, flexible and curved display, active pen, touchless control, and quantum dot. At the end, Mrs. Sweta Dash from IHS gave a keynote about top 10 display trends for 2014 and beyond. The conference ended at around 4:20pm very successfully. Attendees were still lingering around for networking. This entry was posted in Conference Review, Displays, Flexible curved display, ITO replacement, OLED, Quantum dot, Touch screens, travel, TV and tagged active pen, AMOLED, Data Modul, eDC 2014, flexible display, Germany, ITO Replacement, Keynote, Meko, Microchip, Nokia on February 27, 2014 by jennycolegrove. Today at Mobile World Congress (MWC) 2014, YotaPhone and Cypress announced features on the 2nd generation YotaPhone: larger and better displays and both displays will have full touch screen. YotaPhone stands out from the crowd with its low power secondary display on the back, which is made by E Ink. 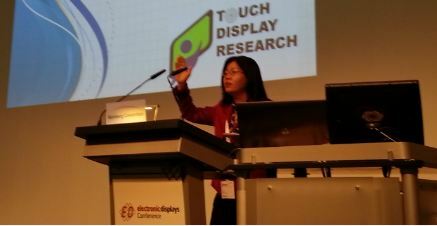 Touch Display Research believes flexible, thin, low power, good sunlight readability display will be suitable for secondary, cover display. For example, in a bright sunny day, when it’s hard to see the information on your mobile phone’s LCD or AMOLED display, you can use your secondary display to show the mobile phone information. 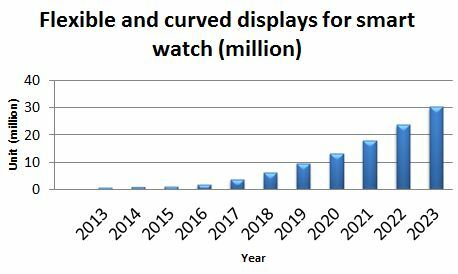 In the “Flexible and Curved Display Technologies and Market Forecast” report, Touch Display Research forecast secondary display will have rapid growth from 2014. This entry was posted in Conference Review, Displays, Flexible curved display, OLED, Touch screens and tagged AMOLED, curved display, Cypress, e ink, e-paper display, flexible display, Mobile World Congress, MWC, MWC 2014, Secondary display, Touch screen, YotaPhone on February 24, 2014 by jennycolegrove. Apple just filed several patent applications on quantum dot display and lighting recently, according to US Patent and Trademark office. One patent application is about better display uniformity can be achieved with quantum dot diffuser and prism sheet. One patent application is using quantum dot with MEMS shutter module. Touch Display Research surveyed many quantum dot suppliers and found that the quantum dot display component market already surpassed $70 million in 2013. We forecast that the quantum dot display and lighting component market will reach $9.6 billion by 2023. Besides Apple, other major brands’ attitude to quantum dot was also analyzed in chapter 6 in the Quantum dot display and lighting technologies and market forecast report. Bill of material (BOM) analysis of quantum dot TV and tablet PC are in chapter 7 in the report. This entry was posted in Company News, Displays, Quantum dot, TV and tagged Apple, patent, quantum dot, quantum dot display, touch display research on February 13, 2014 by jennycolegrove. I was invited to attend Microsoft’s Hardware event recently hosted in their Mountain View, California campus. There were about 100 attendees at this event. After his speech, I asked him about the Microsoft Surface table and tablet. More analysis can be found in Touch and Emerging Display monthly report, February 2014 issue. This entry was posted in Company News, Conference Review, Displays, Touch screens and tagged active pen, Microsoft, Microsoft Surface, Panos Panay, People, Touch screen, touchscreen on February 12, 2014 by jennycolegrove.